For perspective, Hugh’s shoe in this photo is about 12 inches. 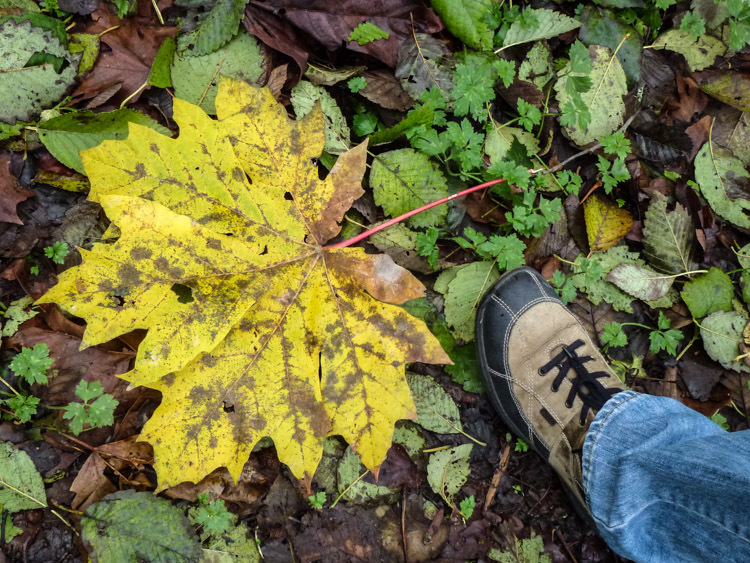 I photographed the fallen leaf in our local green space, Discovery Park. It wasn’t until I started looking at world-record maple leaves that I realize this particular one — although not a record setter — is in the ballpark (or tree park) of some of the largest. The current record is around 21 inches. I’m indoctrinated to not remove anything from parks or beaches, so, unless a dog walker or jogger was similarly mystified by its size, this low-lignin maple leaf is decomposing and releasing its stored carbon back into the cycle. In general, the researchers observed, warmer climates tended to speed the decay of all plants, whereas colder climates slowed plant decay uniformly. The implication is that as temperatures increase, all plant matter, regardless of composition, will decay more quickly, with the same relative speedup in rate. Jeez, that leaf is HUGE! Sie können nicht Nachdruck dieser Artikel Bysimply Hervorhebung dieser Artikel-Version von dieser Seite sowie kopieren Sie dann fügen Sie ihn auf Ihren Internet sites, Information sites, etcetera. Nachdruck diese art von Artikels ohne Einbeziehung der “Autor-Ressource-Box” vintage louis vuitton bags ist eine sehr ernste Verletzung unserer Nutzungsbedingungen für Verlage und konnte sein streng verboten.